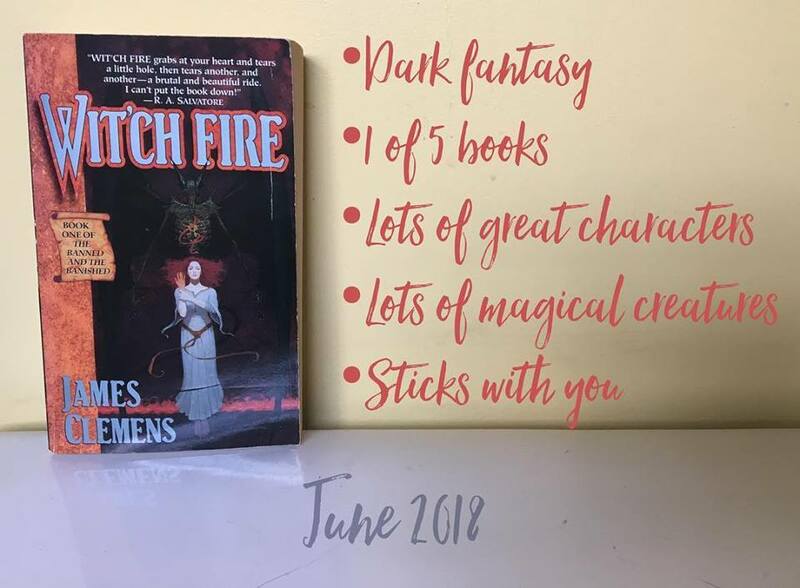 June's book recommendation is Wit'ch Fire by James Clemens (also known as James Rollins). A dark fantasy novel, and the first of five in a series (titled The Banned and the Banished), this is a book that will stick with you. I first read this book (and the following four) at least ten years ago, if not more like fifteen. It was during one of my "I need new books" phases, and I bought it on a whim. I'm so glad I did. I haven't re-read this series since my first read, but that's probably because so much of it has stuck with me. Images, scenes, lines, characters, feelings--over a decade later and I still remember so much. I also still recommend this book to friends pretty regularly. The story follows Elena, a young year old girl who discovers she's a wit'ch (but not like the witches in the Harry Potter series), except in this case, being a wit'ch is cause for death. We follow Elena and many other dynamic, fun, terrifying, and beautiful characters as magic is reintroduced into the world! "On a fateful night five centuries ago, three made a desperate last stand, sacrificing everything to preserve the only hope of goodness in the beautiful, doomed land of Alasea. Now, on the anniversary of that ominous night, a girl-child ripens into the heritage of lost power. But before she can even comprehend her terrible new gift, the Dark Lord dispatches his winged monsters to capture her and bring him the embryonic magic she embodies. Fleeing the minions of darkness, Elena is swept toward certain doom-and into the company of unexpected allies. Aided by a one-armed warrior and a strange seer, she forms a band of the hunted and the cursed, the outcasts and the outlaws, to battle the unstoppable forces of evil and rescue a once-glorious empire..."